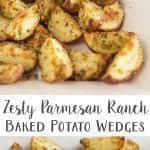 Today, I’m sharing the recipe for these Zesty Parmesan Ranch Baked Potato Wedges as part of a partnership with PopSugar and Hidden Valley®! 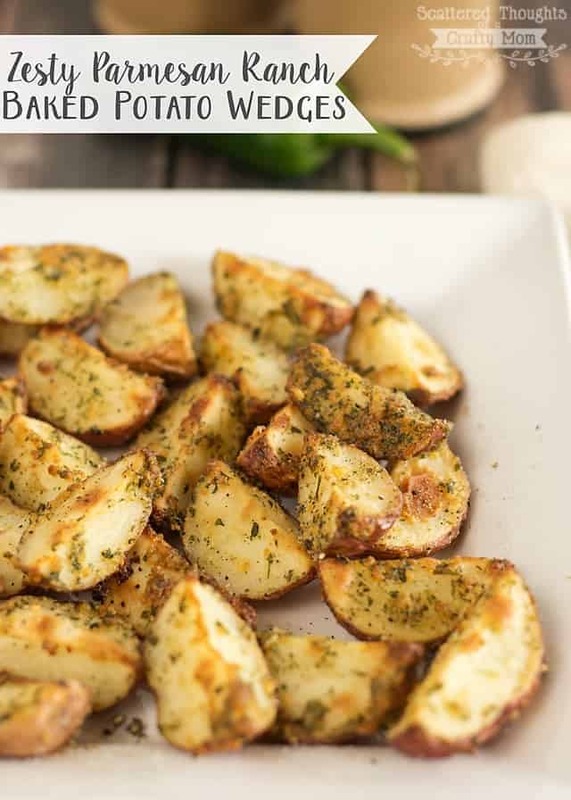 These Oven Baked Potato Wedges are a quick and easy way to dress up your potatoes! One of the daily struggles I face as a mom is to get my kids to eat more veggies. Actually, my daughter will eat a few different veggies; it’s my 9 year old son that’s sending me over the edge with his refusal to eat anything green! Occasionally, he’ll begrudgingly eat a serving of canned green beans, but let’s face it; a growing nine year old boy needs more vegetables than an occasional green bean. On the bright side, I’ve found that if I serve the kids a plate of raw veggies with some sort of dip (before adding the main dish to the plate) they will eat the veggies. Sometimes it’s hummus, but most of the time, I serve the veggies with a spoonful of Ranch Dressing. If you didn’t know, Hidden Valley® has come out with a new Ranch Dip mix made specifically to mix with yogurt! Greek Yogurt is one of my favorite/go to snacks for kids. It’s so good for you, and I love that serving of a Greek Yogurt based Dip means less fat, more protein and fewer calories than a dip made with sour cream. Plus, a creamy Ranch Dip makes those veggies harder to resist! 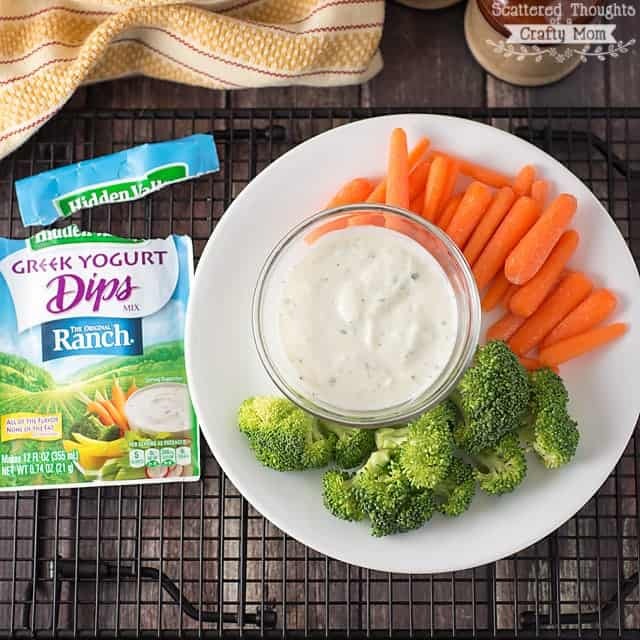 Yogurt Dip is just one way to serve the Hidden Valley® Ranch Greek Yogurt Dip. 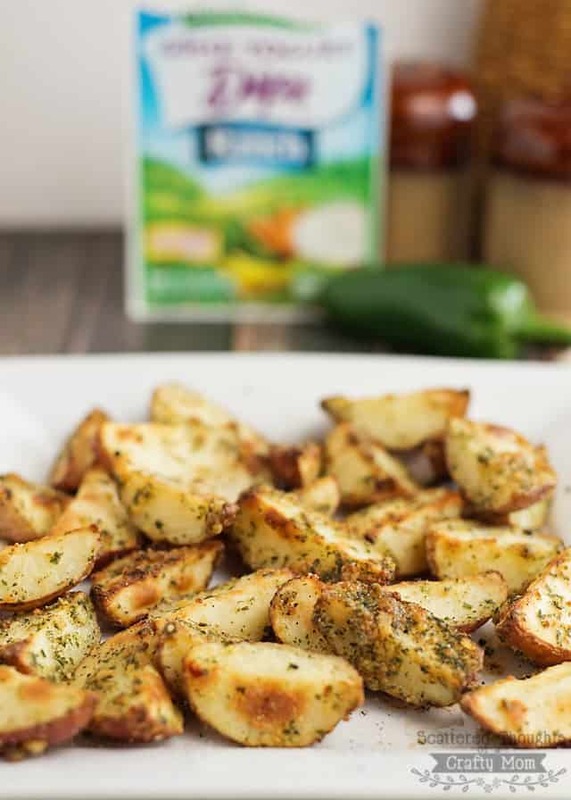 The Hidden Valley® Ranch’s special blend of herbs and spices is amazing on crispy baked potato wedges! You’ll love how easy this recipe is to prepare and everyone else will love the taste. Add potato wedges to bowl, drizzle olive oil over potatoes, stirring to coat potatoes. 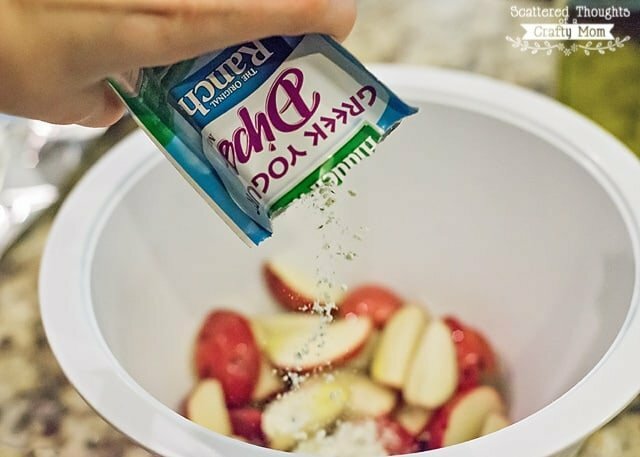 Sprinkle ranch dip over potatoes and toss to combine. Spread potatoes over a greased baking sheet and sprinkle with Parmesan cheese, salt and pepper to taste. oh goodness, these sounds delicious! Im going to pin these to make for later! What an awesome idea! We eat potatoes as a side dish A LOT in our house and these are awesome. Oh I didn't know they did a Greek yogurt version. It looks really good on the wedges. 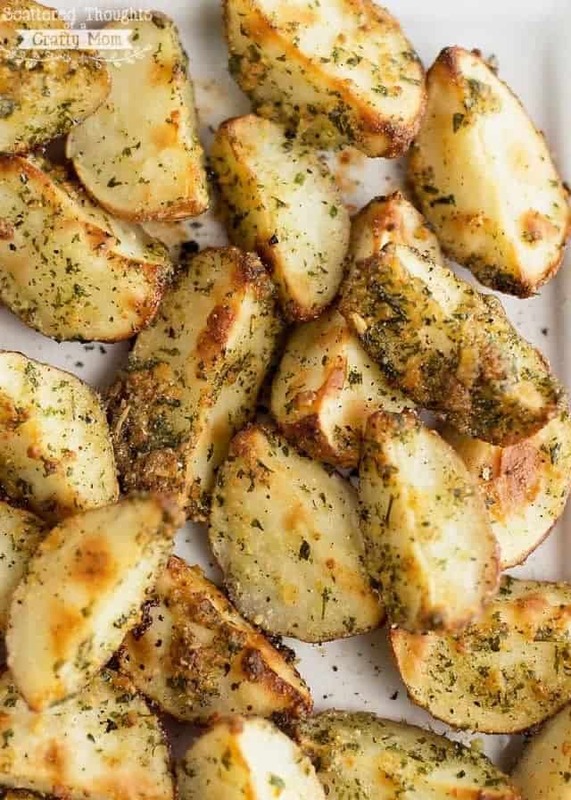 Roasted potatoes are a favorite. I love this idea for changing the spice blend. Ranch with my two boys making eating veggies a lot more enjoyable. There is less complaining when it's served up with ranch. Those really do sound good. I do love my potatoes – actually I also love most veggies as well. I will have to try to make these-definitely different from the usual! Those do look so yummy. I'm a sucker for potatoes, so these are right up my alley! 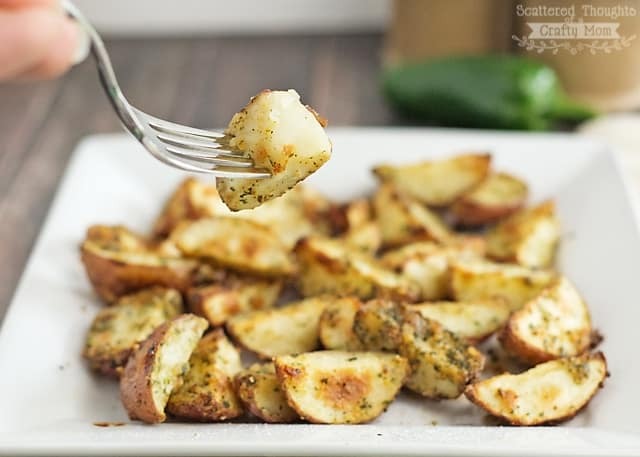 Your potato wedges look so good, and how easy it is to season them with Hidden Valley Ranch Dip! I'll be giving this recipe a try. 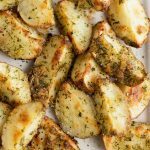 My kids are fairly picky when it comes to what vegetables that they like, but we love roasted potatoes. And the ranch sounds delicious, I'm going to have to try that! My mouth is watering just looking at them. Delicious! Wow. These look absolutely delicious! I need to make some of these this weekend! Thanks! Oh my yum, those look so good and I can't believe how easy they are. Hi, these look great, I was just wondering if they would turn out in an Actifry?